The Def Leppard/KISS Summer Tour 2014 kicks off in Salt Lake City, UT on 23rd June and a local crew member has posted photos/video from the venue. 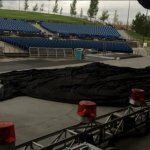 This follows recent postings by a Lep crew member from rehearsals but this time shows the stage/backstage area at the venue in West Valley City, UT. Which was also the venue for the first show in 2012. The KISS "Spider" stage and it's back video screen are shown being put together along with the Def Leppard Meet and Greet tent area. The Summer Tour 2014 kicks off on 23rd June in West Valley City/Salt Lake City, UT in only 4 days time. Lep are currently at a rehearsal studio in Los Angeles preparing for the tour. View some of the photos/video below from SLC.